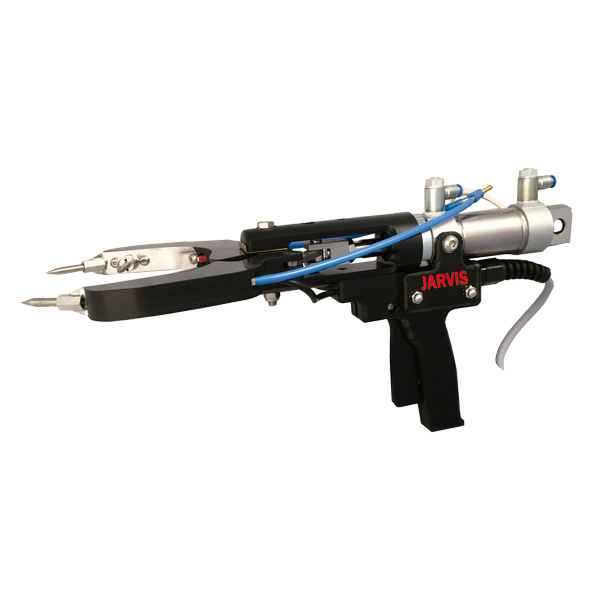 The Jarvis Model 1C – pneumatically powered head only stunner for sheep, bobby calves, deer, pigs and poultry. • The Jarvis Model 1C applies constant pressure between electrode and animal – ensuring high quality stunning every time. • Suitable for halal slaughtering. • Easy and comfortable operator handling – pneumatic power reduces the physical effects of stunning. • Humane stunning procedure for sheep, bobby calves, deer, pigs and poultry. • Shorter, more efficient stunning operations. • Economical to operate, plus rugged construction for longer service life. • Lightweight, tool only weights 5 pounds (2.3 kg).